While it is true that Africans do not have a word equivalent to the term “religion” there are a number of terms in African languages that describe activities, practices, and a system of thought that corresponds closely to what most Westerners mean by religion. African religions are often closely associated with African peoples’ concepts of ethnic identity, language and culture. They are not limited to beliefs in supernatural beings [God and spirits] or to ritual acts of worship, but effect all aspects of life, from farming to hunting, from travel to courtship. Like most religious systems [including Christianity, Islam, Judaism] African religions focus on the eternal questions of what it means to be human: what is the meaning of life, and what are the correct relations among humans, between humans and spiritual powers, and with the natural world? African religious systems [also] seek to explain the persistence of evil and suffering, and they seek to portray the world as operating with some degree of order and predictability. They uphold certain types of ethical behavior. . . These ideas are expressed in sacred oral [and written]traditions, handed down from generation to generation through the performance of ritual [dance and music] and through intensive periods of education, including rites of passage. This long quote is from a person who has studied African religions for many years. It summarizes some important issues related to indigenous African religions. First, it is important to remember that while there are similarities between African religions, there are also differences. Just as there are differences in religious practice in the United States -not just between Christians, Muslims, Jews, Hindus, and others, but even within Christianity (Roman Catholics and many Protestant groups), Islam (Sunni, Sh’ite, Nation of Islam) and Judaism (Orthodox, Conservative, Reform) -so too there are differences in religious belief and practice among African religions. Secondly, although the supernatural -God and spirit world -are important in African religions (as you will learn in the next section), religious belief and practice are central to all aspects of life in Africa. That is, religious beliefs impact the way people live their everyday lives, from what they eat (or cannot eat), the way they farm, do everyday chores, hunt, make tools and clothes, arrange themselves in families, marry, divide work among family members, educate their children, treat illness, and bury the dead. Among indigenous African religions, religious belief and practice are not restricted to one holy day each week, be it Friday, Saturday, or Sunday, but are present in the most common daily activities as well as in special ritual ceremonies. Thirdly, African religions provide people with what some scholars call a world-view. A world-view can be thought of as a system of values, attitudes, and beliefs, which provide people with a mechanism to understand the world in which they live and everyday events and occurrences. Maybe we can think of a world-view as being like a language. Can you imagine how hard it would be explain or understand everyday events and occurrences if we did not have language-words? Words are essential tools that help us explain and understand events and occurrences. But words come with their own meanings, we cannot simply change the meanings of words when we use them to explain or to understand events or why we live the way we do. Words and their meanings help shape the way we see, and therefore how we explain, events. Similarly, the world-view (values, attitudes, beliefs) that an individual learns from the time s/he is a baby provides a mechanism that influences how s/he understands all that happens to her/him, her/his community and the world in which s/he lives. Fourth, African indigenous religions provide a system of morality that establishes right from wrong, good and appropriate from bad or inappropriate behavior. Just as with Islam, Judaism, and Christianity, children growing up in African religions learn right from wrong, and what is appropriate and inappropriate behavior in every situation that they face. Fifth, like all world religions, rituals are important to African indigenous religions. Rituals are cultural or religious ceremonies that celebrate or commemorate specific events that have deep religious significance. Rituals serve to reinforce important religious beliefs through meaningful activities that bring comfort or joy and thus strengthen the unity of the followers of the religious tradition. Rituals are often associated with important human events: birth, marriage, death, planting, and harvest. Finally, it is important to recognize that although the Western world may not be familiar with African Religions, these religions are not primitive, weird, or unusual in comparison to other religious perspectives. 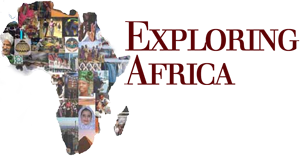 Throughout this activity, while reinforcing that African religions are important in their own right -and in fact existed long before the introduction of Christianity and Islam -, we will also make comparisons to other world religions to show that the African world views and belief systems are not unusual. Scholars who study religion in Africa tell us that all African societies have a belief in God. Some African religions believe in one supreme God who created the world and all that is in the world. Other African religions believe that there is more than one God; however even in these religions, usually one of the Gods is claimed to be the supreme God who was responsible for creating the world. Since there are many different language groups in Africa, there are many different names for God. [Click here for African Names of God] Even within a single country there are often a number of different names for God. Whether or not a particular African religion believes in one or several Gods, the way God is viewed in most African religions is both similar and different than the way the monotheistic religions characterize God. Judaism, Islam, and Christianity are the main monotheistic religions. These religions teach that there is only one God and that that God not only created the universe, but also has complete control over that universe. Moreover throughout history, the one supreme God communicates directly with humans, and God is directly involved in the lives of humans. According to Professor John Mbiti, a leading expert on African religions, many African religions share the following concept of God. These concepts are quite similar to the way God is viewed in Christianity, Islam, and Judaism, the three main monotheistic religions. God is creator of all things. Human-beings cannot directly know God. Given these similarities it should not be surprising that Africans from all over the continent often accepted the introduction of Islam and Christianity into their communities. In spite of these similarities there are important differences in the way God and the supernatural are viewed in African religions in comparison to Islam, Judaism, and Christianity. In most African religious systems, God (or the Gods) after creation was not directly involved in the human society or the individual lives of people. Remember how in the creation stories the Gods were engaged in the creation of people, but after creation, the Gods usually withdrew from direct contact with human-beings? The idea of an isolated God does not make the supernatural unimportant in Africa religions. Indeed, the supernatural, or spiritual realm, is most important to African religious belief. Between an all-powerful God and humans is a pantheon of spirits. These spirits are directly engaged in the lives of human beings, and can act as intermediaries between God and humans. Spirits in African religious traditions share some of the same characteristics of angels in the Christian, Islamic, and Jewish traditions. Good spirits help to protect against illness and misfortune and assist humans by providing rain needed for crops, as well as, fish and game animals used for food. However, not all spirits are good, some spirits are viewed as evil and are believed to be responsible for illness, premature death, and other forms of suffering and misfortune. The spiritual world, or world of spirits, is central in almost all African religions. Spirits (like Angels and demons in the Jewish, Islamic, and Christian traditions) directly communicate with and impact the lives of human beings, as individuals and as communities. The Recent Dead Ancestors: After an elder dies her or his spirit remains actively interested and engaged in the life of their family and community for many years. The ancestral spirits are most concerned about the prosperity and security of their families and communities. They intercede with God on the behalf of their communities. However, if individual members of their families or communities as a group engage in inappropriate behavior, the ancestors show their displeasure by withdrawing their protection-their willingness to seek God’s blessing on their descendants. Although this results in illness and misfortune, it is not the desire of the ancestors that their families and communities be destroyed. Rather, the ancestors hope that illness and misfortune will be seen as warning and result in people and communities stopping the inappropriate and offensive behaviors. Remember that African religions hold that following social and cultural norms and values is the only way to guarantee security and prosperity. No wonder the ancestral spirits want their descendants to behave appropriately! The Spirits of the Long Dead: As time passes, the spirits of the recently dead gradually withdraw from the lives of their descendants and communities. It is believed that these spirits live with God. However, some ancestral spirits remain actively engaged for many generations. This is particularly true of the spirits of important individuals. For example, it is believed that the spirits of great rulers or founders of nations maintain their interest and power for a long time, perhaps centuries after their deaths. These ancestors are most interested in promoting the longevity of their kingdoms, nations, and communities. As with the regular ancestral spirits, these spirits intervene to protect their communities. In Module Seven B: African History there are examples from Kenya, Tanzania, and Zimbabwe of ancestral spirits encouraging people to resist colonial rule that was perceived by the ancestors as destroying African nations, cultures, and societies. Given the importance of spirits of the ancestors, most African religions taught great respect for the ancestors. In addition to living appropriately, special shrines were often built to commemorate the ancestors. These shrines, while different in style, have a similar function to grave-stones in the Christian and Jewish traditions. In addition, respect is shown by giving libations to the ancestors. That is, at least once a day, symbolic drink and food is presented to the ancestors. When Europeans first encountered these practices, they wrongfully thought that the people were worshiping the ancestors. In African religions, ancestors are not gods and they are not worshiped, but just treated as living elders and thus are given great respect, even more so if the spirits of the ancestors are widely remembered and respected. Moreover, ancestral spirits are not feared. Although their blessings are important to personal and community well-being, appropriate behavior is all that is required to maintain social harmony, longevity, and the ancestral contentment. All African religions believe in the existence and importance of human spirits; however, not all African religions believe in nature spirits. Nature spirits are spirits that inhabit or live in nature. For example, several African religions teach that there are spirits that live in the skies. These spirits are important since they are believed to control the rain that is so important to the raising of crops and animals. Other African religions hold that spirits live in and control rivers, lakes and oceans. These water spirits are also very important since they are believed to control the fish that live in the waters. Still other religious traditions believe that important ancestral spirits inhabit rocks, mountains, and trees. As is the case with ancestral spirits, nature spirits are held to be good since they help to protect people and to provide people with essential items like water and food. In order to guarantee the good will of these spirits, African religions practice rituals and ceremonies that honor these spirits. Just as the early European missionaries misunderstood the role of ancestral spirits in African religions, so too they often misunderstood the beliefs regarding nature spirits. These outside observers thought that African religions held that God inhabits all of nature -trees, rocks, water, land -a religious system scholars call animism. African religions do not worship rocks, trees, the sky or rivers, as is the case in animism. Rather, important spirits who control the forces of nature are believed to live in the sky, rocks, trees and rivers. The intervention of bad or disruptive spirits. Just as there are good spirits these religious traditions hold that there are bad spirits (referred to as the devil or Satan in Christianity, Islam, and Judaism). In African religious traditions, bad spirits are responsible for causing much of the misfortune that individuals and communities suffer. Most African societies have specially trained spiritual professionals who through special medicines and communication with the ancestral spirits can provide protection against the wiles of evil spirits. Every religious tradition have individuals who perform specific religious tasks and duties. Each religious tradition has special titles for religious officials -rabbi, imman, minister, pastor or priest. In African religious traditions, there are different religious roles; these include priests, rain-makers, and healers (diviners, herbalists) In some African traditions, these various roles may be served by the same individual, or in other traditions different persons may serve each position. We should consider religious leaders to be professionals in that each position requires a long period of training. Moreover, these positions are often full-time, leaving little time for activities beyond the fulfillment of their duties. We should also note that in most African religious traditions both women and men serve as priests and healers. The role of priests varies between religious traditions. One of the most important functions of priests in many traditions is to officiate at religious ceremonies and rituals. Religious ceremonies and rituals are very important to maintaining religious and cultural traditions. Ritual ceremonies celebrating birth, transition to adulthood, marriage, death, planting and harvest, or commemorating the life of a deceased ancestor are vital to maintaining a close-knit community. Such rituals also help to reinforce values and appropriate behavior within the community. Priests, who officiate at these rituals and ceremonies, play a central role in promoting a strong and united community. In some religious traditions, priests will be affiliated with a particular spirit or group of spirits. In this situation, priests will be in charge of a special shrine dedicated to the spirit, and she or he officiates at special ceremonies commemorating that spirit. For example, in many African religious traditions, there are special shrines to commemorate the founding ancestor of the community. In addition to officiating at special ceremonies celebrating the ancestor, the shrine priest(s) serves as the voice of the ancestor spirit, communicating advice and admonition to the community. How do the ancestral spirits communicate to their priests? As part of her or his religious practice, a priest will enter a trance-like condition during which time it is believed that the spirit of the ancestor enters or “possesses” the body of the priest. During the possession, the ancestor directly communicates with the priest, passing on information to the people. Module Seven B: History of Africa gives an account how ancestral spirits in Kenya, Tanzania, and Zimbabwe communicated through shrine priests their wish for the local community to resist European colonialism which was destroying local cultures, traditions, and communities. Click here for pictures of priests, shrines, and ritual performance. With the exception of the area of tropical rain forests in West and Central Africa, much of Africa is either arid or semi-arid and suffers from fairly regular cycles of drought. 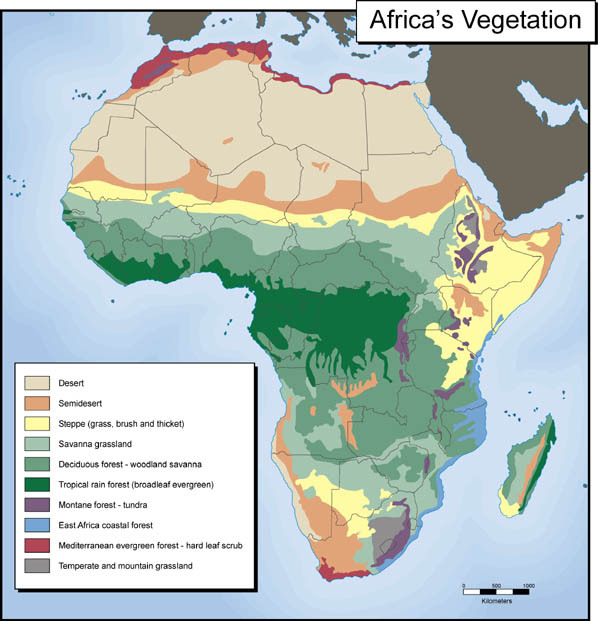 (See Module Six: Geography of Africa and Climate/Vegetation Map of Africa) In vast areas of East, West, Central, and Southern Africa, farmers are dependent on rain for their very survival. Throughout these regions, rain is an important focus of religious practice. As you learned, many religious traditions in Africa view misfortunes such as drought to be a result of inappropriate behavior on the part of community members, or of the disruptive influence of bad spirits. Rain-makers are special priests who are responsible for finding out the cause of a drought and to devise a remedy to the problem that has caused the drought. Rain-makers through possession communicate with ancestral spirits to find the cause of the drought. Once the cause of the drought has been identified, the ancestral spirits will provide the rain-maker with a remedy. The remedy usually involves changing an inappropriate behavior that is believed to have caused the drought and offering special libations to the offended spirits. Healers, often referred to as traditional doctors, are important in all African societies. Given what we know about African religious traditions, including healers as religious leaders should not be surprising. Good health is the believed to be the result of appropriate behavior -that is living in accordance to the values, norms of traditions of the society. One of the primary causes of illness, then, comes from inappropriate behavior. In addition, illness can be the result of the work of bad spirits. In either case, illnesses have a spiritual basis, that in turn, requires a spiritual remedy. In most African religious traditions, there are two methods of healing. In some traditions, these two methods are practiced by the same healer; in other traditions, there are separate practitioners. To be a practitioner of either type of healing takes experience and great skill developed over many years of training. Training to be a healer in Africa takes time and effort just as training to be medical doctor in North America does. Herbalists: Extracts from plants -fruits, berries, roots, leaves, bark -provide the basis of the medicines used by traditional healers in Africa. Herbalist healers go through a rigorous training through which they learn about the healing properties of a wide variety of plants. When they finish their training, herbalist healers will be able to prescribe herbal remedies for many different illnesses. On occasion, a healer will be confronted with a new and strange disease. In these situations, the herbalist will seek assistance from the spiritual world. As described above, the healer will enter a trance in which she or he is possessed by a spirit. The spirit will lead the healer to an appropriate remedy. Spiritualists/Diviners: Diviners treat illness primarily through facilitating the direct intervention of the spiritual world. If an illness is believed to be caused by inappropriate behavior on the part of the patient, a remedy or cure for the illness can only come through spiritual intervention. While a herbal healer uses plants to treat diseases, a diviner seeks input from the spiritual world to understand the cause of the illness and prescribe a cure. Usually a diviner is possessed by the same ancestral spirit with whom she or he has developed a special relationship. In addition to treating specific illnesses, African healers -herbalist and diviners- also practice preventative medicine. Patients may come to the healer seeking protection from misfortune. Or a person undertaking a long journey may want a remedy that will provide safety on her trip. Another patient may want a remedy that will provide wisdom and clarity in making an important decision. When Europeans first observed African medicine and healing practices, they often had a negative reaction. They viewed these practices as being based on magic and not on science. These judgments were based on a misunderstanding of African views on disease and healing. Indeed, like “western” medicine, African healing is based on close observation of the patient and his or her disease and on the use of remedies -medicines- that have a track record for successfully treating a particular ailment. During the past thirty years, Western trained doctors have gained a greater appreciation for African healing techniques and practices. Indeed, throughout Africa it is now fairly common to have Western trained doctors working with traditional healers in the treatment of patients. Indigenous African religions continue to be very important in many African societies. However, African religious beliefs and practices have not remained unchanged. The spread of Islam and Christianity has influenced the practice of indigenous religious practice. But just as importantly, as will be demonstrated in the next two sections, African religious belief and practice has influenced the way Islam and Christianity are practiced in Africa. African religious belief and practice have also had an impact outside of Africa. Just as trade from Asia and Europe helped to facilitate the spread of Islam and Christianity in Africa, so too travel and trade facilitated the spread of African religious traditions into Europe and the Americas (See Module 15: Africa and the World). The Atlantic slave trade and more recently the new wave of immigration of African to Europe and North America assisted the transfer of religious practice to these areas. Two of the most important examples of African religious expression in the Americas are the religions of Santeria in Cuba, and Brazil, and Vodou in Haiti. Both of these religious traditions have a growing following in the United States. OR go to your library and look up these religions in the Africana: The Encyclopedia of the African and African American Experience edited by Kwame Anthony Appiah and Henry Louis Gates Jr. Basic Books, 1999. Please complete the following exercise. 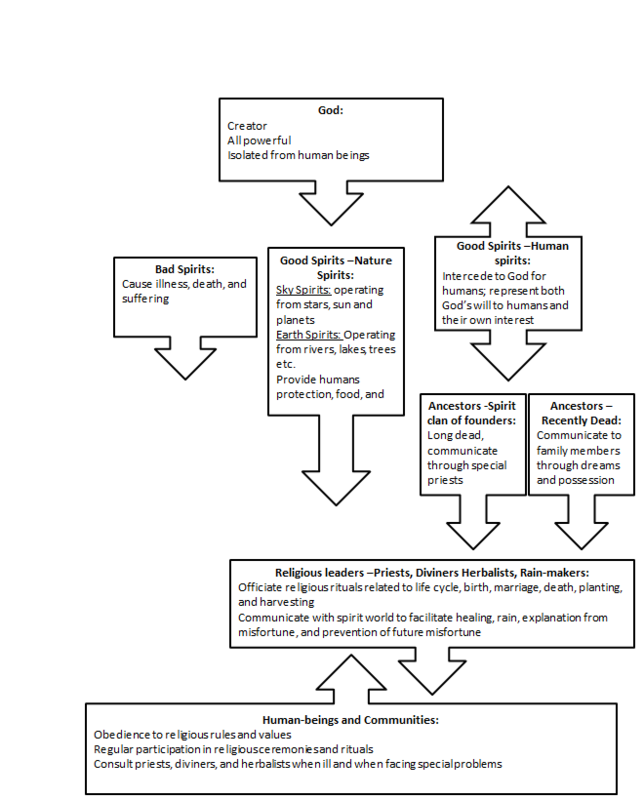 In preparing your answers, you may want to look at Chart One: Spiritual World of African Religions. Map Work. 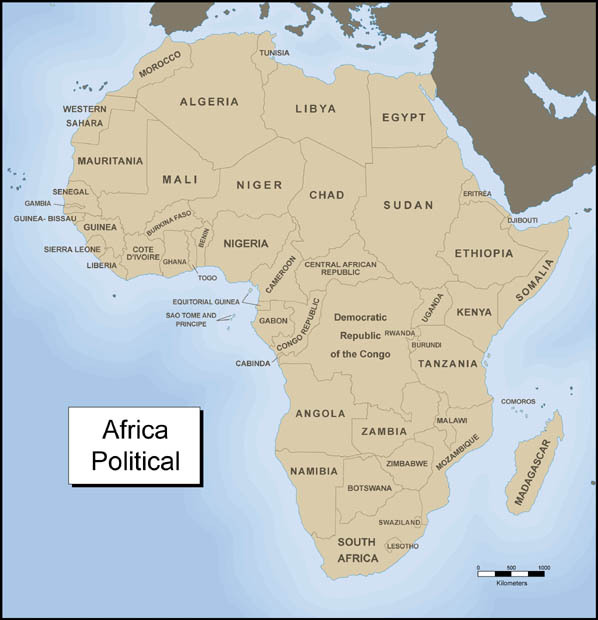 Using the list of the name for God in African languages and a political map of Africa which your teacher will provide (Click on Political Map) enter on the map the names of God used in those countries. In your own words, describe the importance of ancestors to African religions and societies. According to most African religions, what are the two main causes of disease and misfortune? How can people promote security and well-being of themselves, their families and communities?